The remaining records of the so called Auschwitz death books contain 68,864 death entries issued by the Political Department (camp Gestapo) between 29 July 1941 and 31 December 1943. The vast majority of these deaths were due to “natural deaths”, exceptions are for instance 107 executions listed for 1941 and 206 deaths due to accident, shot on escape or suicide. 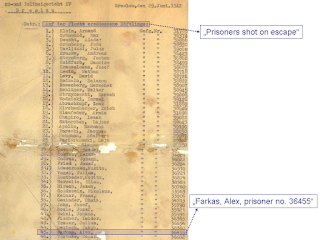 It is important to note that these records refer only to registered prisoners in the camp, while most people murdered in Auschwitz were taken to the extermination sites directly from the transport ramp without being registered in the camp. Still, the small proportion of killings and the fact that almost all deaths were due to some sort of disease stands in contrast what is known mostly from testimonial evidence about extensive atrocities carried out also among registered prisoners. There were reportedly many small and large scale killings by hanging, shooting, phenol injection, beating to death and homicidal gassing for instance. This apparent contradiction is resolved when looking into what the people who were involved in ordering, compiling or issuing the death records or had some sort of access to these matters testified about their origin. The accounts of Auschwitz commandant Rudolf Höß, the SS medical orderly Josef Klehr, the SS private in the Political Department Pery Broad as well as of the former prisoners Karl Lill, Raya Kagan, Tadeusz Holuj, Emil de Martini, Wladyslaw Fejkiel, Jan Pilecki, Tadeusz Paczula, Ludwik Kowalczyk, Hermann Langbein and Wieslaw Kielar are compiled here. The testimonial evidence reveals that the death causes of registered prisoners and thus the death book entries were in fact systematically falsified. "A prisoner called Skrzetuski, Janusz, prisoner number 153, pushed away the stool with his own feet." Many other examples, which are established from a mix of documentary and testimonial evidence from the prisoner clerk Tadeusz Paczula, can be found in the publication "Death Books from Auschwitz". But the falsification of death causes is also corroborated and confirmed by relying strictly on documentary evidence. The prisoners Abram Warszawski, Alex Farkas and Hans Redlich all died of “sudden cardiac attack” according to the death books, whereas they were “shot on escape” according to entries in the guard leader book. 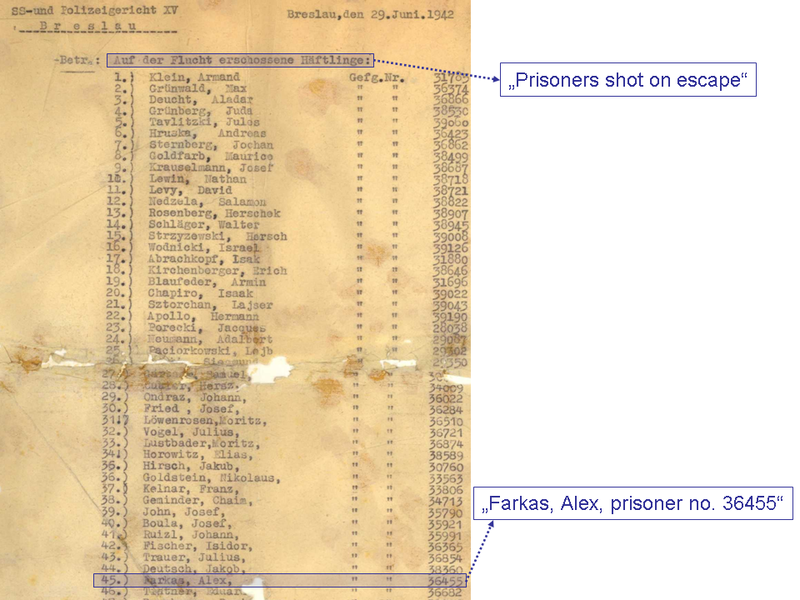 In case of Farkas there is also a report from Auschwitz to the SS court in Breslau confirming he was shot on escape. 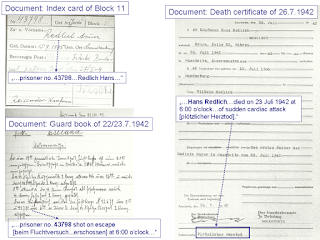 The card shown as "death book entry" is the notice of death for the civil registry office (It was issued on June 29th 1943, death was confirmed by a physician on the 19th, ten days earlier. The notice in the death book would have that date). 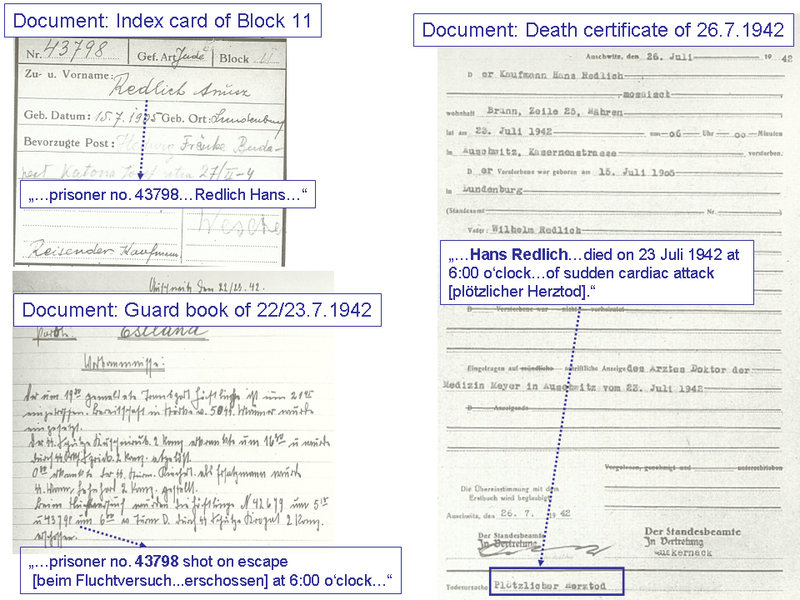 German death certificates have (and presumably had) a confidential and a nonconfidential / statistical part. The confidential part was only to be opened by physicians of the ministry of health and relatives, the non confidential part is for statistics and is sent to the civil registry office. The diagnose is explained in detail in the confidential part, the statistical part has not very much choices. In any case where a diagnose does not match the given choices, "cardiac arrest" is mentioned, because in the end that is always correct. (That does not rule out that the physician was too lazy to investigate or lied, like today).